If you’ve been in collaboration hell, here is Part I of two techniques that might help. Lots of people would like a Track Changes feature in PowerPoint, like the one in Microsoft Word. But so far, it doesn’t exist. But there are 2 features that you can use that you can use instead to collaborate with others. In fact, the second one comes close to a Track Changes features, in a roundabout way. This is how the Comments section of the Review tab looks in PowerPoint 2013. Comments provide a way for you to add your opinion or suggest changes. On the Review tab, click New Comment to open a text box, either on the slide (PowerPoint 2007 and 2010) or in a task pane (PowerPoint 2013). Type your comment and press Enter. 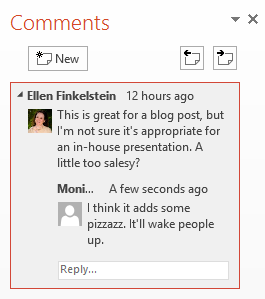 A new feature of PowerPoint 2013 is that others can reply to comments, so that you can create a conversation. Comments will show your initials or even your photo, if you’re using a Microsoft account. You can easily move from comment to comment and of course, you can delete comments. Here’s a short comment conversation in PowerPoint 2013. If a comment is collapsed or just shows as an icon, double-click it to display it. Save your presentation on your computer. You’ll compare this presentation with the one that your colleague changes. Send the presentation to a colleague. If you attach it to an email, this process creates a copy. You can also post the presentation to a shared location, such as your OneDrive storage. In that case, you’ll need to give your colleague the link to the presentation and provide editing permission. In the email or link notification, ask your colleague to make suggested changes and return it to you with another name (such as v2 at the end of the file name). When the changes are done, open your original presentation and choose Review tab, Compare. In the Choose File to Merge with Current Presentation box, navigate to the changed presentation and click Merge. The Revisions panel opens, listing the slide and presentation changes. (Changing the theme or adding a slide would be presentation changes.) You’ll also see an icon on a changed slide showing the changes, as you see here. This is as close to Track Changes as you can get in PowerPoint. To accept a change, check the checkbox in front of it. When text was replaced, you need to check both the insertion and the deletion. If you don’t accept a change, the presentation stays as is on your computer. In the next blog post, I’ll discuss a way to collaborate in real-time with a colleague, using the online version of PowerPoint. 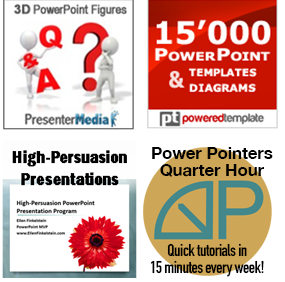 Meanwhile, leave a comment to share how you collaborate on PowerPoint presentation files!